Iconic skateboarder Tony Hawk will announce a new game on Saturday, presumably at the Spike VGAs. Here's Tony Hawk's cryptic tweet: "I'll be announcing the upcoming release of something new on Sat; the same day as the Spike Video Game Awards. Coincidence? I think not." There hasn't been a Tony Hawk skating game since October 2010, and the release of Tony Hawk: Shred. Like Tony Hawk: Ride before it, Shred was based around an expensive motion-sensing skateboard peripheral. Sadly, Tony Hawk: Shred was a flop, as was Tony Hawk: Ride. This led to lay-offs at developer Robomodo. But Robomodo wasn't closed and is, today, trying to raise money from the public for an XBLA Kinect game called Bodoink. Whether Robomodo is involved with Tony Hawk's new game we'll have to wait and see. However, the days of third-party plastic peripherals are over. 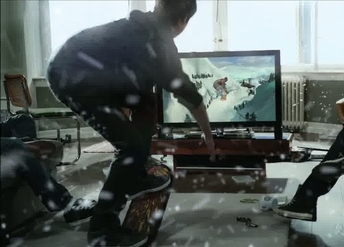 Guitar Hero, Rock Band, DJ Hero and Tony Hawk: Ride/Shred have all been shelved in favour of today's Zeitgeist: dance games on Kinect, Move or Wii. Perhaps a new Tony Hawk game will go back to the series' mega-popular roots and be controlled by a pad. This worked well for EA with Skate, after all - although that series is MIA since 2010, too. The other question to be answered is whether Tony Hawk's new game will be for next-generation consoles.